The following is a list of all entries from the I SCREAM! category. 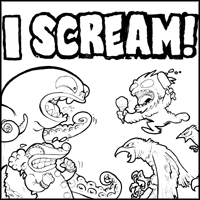 Monkey’s Paw #7: Doctor Müteau Fears the Wurst… and Bonus Comic: I Scream! Click the above image to see it full size. Bonus comic this week! Click the below image to read it. Subscribe to Monkey’s Paw here. A new strip every Friday! RSS Feed for entries in this category. MONKEY'S PAW is ©copyright Ben Zmith and Steven Stwalley.